Known for its use of very unusual animal proteins like bison, Pacific salmon, wild boar, and roasted duck, just to name a few, Taste of the Wild dog foods offer pet parents not only viable alternatives to mainstream brands, but it could very well be the only source of well-balanced nutrition for your hound. Putting real, high-quality ingredients into each formulation that mimics the kind of food that ancestral dogs fed on in certain regions of the nation like the Sierra Mountains, the Rockies, and the Wetlands, just to name a few, the Taste of the Wild brand of dog food is one of canine food products that pet parents are always happy to give to their pets. In this review, we’ll try to look at the brand’s 5 best-selling variants that you can also give to your hound. The label may read “with real roasted bison and venison”, but the TOTW High Prairie Canine Recipe actually contains buffalo, lamb, and chicken as its principal animal protein sources. 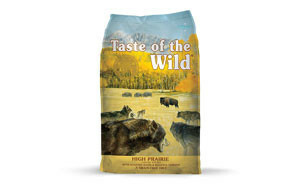 Consistently garnering positive dog food ratings, the High Prairie TOTW dog food is one of the best especially if you consider the numerous Taste of the Wild dog food reviews. The inclusion of novel proteins really makes the High Prairie a preferred variant especially for those who are looking for a grain free dog food formulation. The addition of 5 different strains of probiotics helps ensure your pet gets optimum digestive and immune system health. There are prebiotics, too in the formulation, alongside a bevy of fruits and vegetables like tomatoes, raspberries, and blueberries. The ratio of omega-3 to omega-6 fatty acids may not really be the ideal 1:4, but it sure is better than most dog foods with these essential fatty acids. Surely pet parents who gave the High Prairie excellent dog food ratings can’t be wrong. If you’ve got a hound that absolutely adores fish, it will love the TOTW Pacific Stream Canine Formula with Salmon in Gravy. This Taste of the Wild canned dog food formulation comes with salmon and its broth which is mixed with sufficient water just to meet the moisture requirements of dogs. In addition to the fresh salmon included in the formula, the Pacific Stream also comes with turkey and turkey liver, further adding to the delicious taste of the wet dog food. Also included are eggs, potatoes, sweet potatoes, peas, tomatoes, raspberries, and blueberries. It is the kind of grain free dog food that is best for convalescing hounds as well as very young puppies that are still learning to switch from all-milk diets to one that includes solids. The Taste of the Wild Salmon recipe is rich with antioxidant vitamins as well as health-giving minerals that your dog can truly benefit from. It’s the closest thing to an ancestral dog diet that you can give to your modern hound. If you’re wondering what ancestral dogs in the Appalachian region ate in their time you only need to get the Taste of the Wild Appalachian Valley Small Breed Canine Formula. Since it’s for small breeds many pet parents actually consider this a Taste of the Wild puppy version. With venison and lamb forming the core of its animal proteins, the Appalachian is the perfect meal for the perfect pup. The 100 million colony-forming units of microorganisms are guaranteed to give your small dog the level of digestive health it needs to help process all the nutrients necessary for its growth and development. Adding to the nutrients provided by deer and lamb are those sourced from duck and ocean fish. This also gives the Appalachian grain free dog food a healthy dose of EPA and DHA necessary for boosting the immune system and ensuring that the nervous and cardiovascular systems are at their peak performance. The Appalachian TOTW dog food boasts of an exceptional proportion of proteins and healthy fats without the worries caused by gluten allergenic ingredients. This Taste of the Wild salmon recipe is more like the canine version of one of man’s most prized delicacies: smoked salmon. It may not enjoy the rave dog food ratings of the High Prairie, but it sure makes for a healthy alternative especially if you’ve got a hound that is already fed up with meat-based diets. The Pacific Stream with Smoked Salmon contains some of the best catches of the sea, combining it with naturally-caught wild salmon to give your pet a kind of diet that is truly a feast. Raspberries, tomatoes, blueberries, lentils, and potatoes are also added to provide your pet with the right amounts of nutrients it needs. There are prebiotics and probiotics, too that work well to help provide hounds with a digestive system that is fully capable of processing almost anything. This TOTW dog food is perfect for all breeds and in all life stages. If it’s grain free dog food in a sumptuous salmon and ocean fish flavor you’re yearning for, then the Pacific Stream is for your dog. Pet parents living in wetlands will surely love the sumptuous duck flavor of the Wetlands Canine Formula with Fowl in Gravy by TOTW. The formulation comes with premium-quality duck and chicken. The brand didn’t stop there, however. The Taste of the Wild canned dog food also includes smoked turkey, eggs, roasted duck, roasted quail, and ocean fish in a grain free dog food formulation to give your pet the best-tasting fowl dish it can ever have. It’s the perfect meal for water-loving hounds as well as those that are already tired of the same usual stuff of beef, chicken, or lamb. The addition of potatoes, peas, raspberries, tomatoes, blueberries, and sweet potatoes give the Wetlands exceptional nutrient profile that only these ingredients can provide. One thing that is worth mentioning is that the Wetlands formulation doesn’t come with water. Instead, it uses the broth from its duck and chicken recipe to deliver the moisture that dogs need. It could also very well be the best Taste of the Wild puppy formulation. Taste of the Wild is a brand that strongly believes in the existence of a genetic link between dogs of the past and the pets that we have today. The emphasis is on the formulation of premium-quality, grain free dog food that is based largely on the ancestral diet of dogs. Each formulation is designed specifically by in-house veterinarians working closely with veterinary nutritionists to come up with a near-historically accurate representation of what dogs in the past flourished on. The brand is well-known for producing dog food that is based on the geographic diets of ancestral dogs. These include the Southwest Canyon, Pine Forest, Canyon River, Sierra Mountain, Wetlands, High Prairie, Appalachian Valley, and Pacific Stream. Their Appalachian Valley formulation is specifically geared for small breeds while the High Prairie and Pacific Stream also come with puppy formulations in addition to the all-life stages presentation. According to various Taste of the Wild dog food reviews, the brand is under the Diamond Pet Food group. Unfortunately, this is where some pet parents have misgivings about the brand because of Diamond’s peculiar history of product recalls. It should be safe to say, however, that there were no product recalls that are specifically targeted at Taste of the Wild variants. There are many reasons why a lot of pet parents consider the Taste of the Wild as an excellent choice when it comes to dog food. Here are some of the reasons why. While TOTW has variants that come with chicken and beef as their principal animal proteins, a greater number of the TOTW dog food products come with unique animal proteins such as venison, bison, and buffalo, just to name a few. This can have remarkable implications especially in dogs that are known to be allergic to chicken and beef. Because the dog’s body has not yet developed hypersensitivity to these novel or unique proteins, the likelihood of TOTW dog food causing food allergies in dogs is very minimal. The other benefit is that the formulations come with moderate to high levels of proteins that should easily translate into healthier hounds. There are an increasing number of pet parents who realize the implications of going for grain free dog food formulations. Unfortunately, many dog foods that are labeled as grain free seem to forget that chicken and beef are also allergenic. As a matter of fact chicken and beef are more allergenic than soy, corn, and wheat. Since TOTW uses unique or novel animal proteins its grain free formulation, thus provides a much safer and more effective hypoallergenic diet for pets that may have issues with hypersensitivity reactions. Since Taste of the Wild uses only select novel animal proteins and easily digestible carbs, pet parents can feel more secure in the knowledge that their pet will be able to utilize all the nutrients found in its food. Moreover, the addition of prebiotics and probiotics help improve overall digestion, ensuring that the different nutrients such as antioxidants, vitamins, minerals, amino acids, and fatty acids are efficiently absorb by the dog’s small intestines for distribution throughout its body. 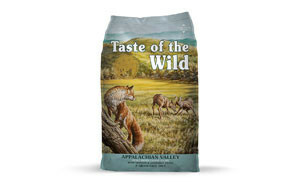 Taste of the Wild provides a well-balanced nutrient profile for all of its formulations. It is fully compliant with the standards set by the AAFCO for the various life stages of dogs. They do have specialty diets for small breeds as well as for puppies. Generally, however one can always rely on the fact that Taste of the Wild always takes into consideration the proportion of nutrients that canine ancestral diets may have had. Also, by capitalizing on geographic or regional idiosyncrasies, the brand is able to fully utilize the bounties of the land. This helps ensure that the nutrient profile for each variant is as close to what the ancestral diet would look like. A careful analysis of the ingredients contained in each TOTW dog food reveals that it has an exceptional choice of unique or novel animal protein sources. Whereas other brands of grain free dog food have chicken or beef in their formulations, Taste of the Wild boasts of a selection of a variety of animal proteins that are specific to each geographical region. For instance, the High Prairie comes with real buffalo meat, lamb, bison, and venison – animals that one can readily see in prairies. The Pacific Stream comes with salmon and ocean fish while the Sierra Mountain features lamb as its principal animal protein. The Wetlands comes with duck, quail, and turkey while the Rocky Mountain variant contains venison and salmon, although its principal animal protein is chicken. The Pine Forest features venison and lamb while the Southwest Canyon variant boasts of wild boar, although the main protein is beef and lamb. The Canyon River features trout and ocean fish while the Appalachian comes with venison, lamb, and duck as its animal proteins. The protein content of the TOTW dog food range from as low as 25% to as high as 32% for its dry food formulations. The Taste of the Wild canned dog food variants come with at least 7% proteins. It may look lower than its dry food counterpart, but it really is more protein-rich if you try to compute only for its dry matter weight. Whether it is dry or canned dog food one can always expect the protein content of the Taste of the Wild brand to be of the highest possible quality. The novel proteins also make them ideal for dogs that are already allergic to chicken and beef. True to being a grain free dog food the Taste of the Wild formulations never contain allergenic grains like corn, wheat, and soy. However, the brand also recognizes the importance of carbs in the health of dogs. It provides an interesting selection of healthier and more wholesome carbs like potatoes, sweet potatoes, lentils, and peas. Unfortunately, if you have a pet that is diabetic, you may want to steer clear of potatoes and sweet potatoes as these are very starchy foods that have high glycemic indices. The inclusion of tomatoes, raspberries, and blueberries provide additional nutrients in the form of vitamins and minerals as well as antioxidants that can provide a host of benefits for your pet. Other ingredients that are mainstays in the TOTW list include prebiotics, probiotics, and essential fatty acids. 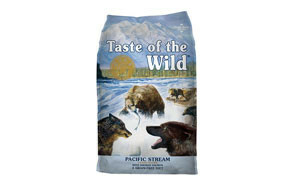 Taste of the Wild is an exceptional brand of dog food that boasts of using unique and novel animal proteins as its main ingredient. It provides well-balanced nutrition for all dog breeds and comes in a remarkably delicious, nutrient-rich, and grain free dog food formulation.